It might sound surprising, but in the middle of the Italian peninsula you will find a snow massive with the high peaks of the Appeninian mountain range. This is Abruzzo, a region which during the Winter months will show you a beautiful winter landscape packed with snow, but also interesting culture to discover. In Abruzzo area, with for example Gran Sasso and Majella mountain peaks and the nature reserves of Laga and Sirente-Velino that you will find the major ski resorts of this region. Hundreds of ski slopes on offer, covered in a deep layer of tempting snow that tend to last well into the spring. 400 kilometers of ski slopes, 16 ski schools, 21 ski resorts and 115 ski lifts - a fantastic place for all ski lovers. Well eqiupped ski resorts are being developed among all the picturesque mountain villages. You will encounter a mixture of the past and the future, all mixed in a lovely combination. The striking variation of the landscapes and surroundings of Abruzzo creates the Foundation of a wide assortment of winter sports. You can not only come here for skiing, but also go cross-country skiing on the plateaus such as Campo Imperatore, or Little Tibet. 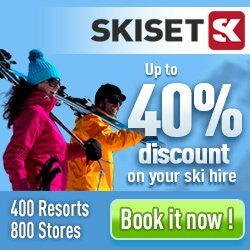 You will also find good offers for snowboarders, hikers, snow shoe hikers, ice climbers for practisers of all levels. You can also find skilled instructors to assist you. The ski area of Nevi is also worth mentioning as it, together with Campo Imperatore, includes Ovindoli and Campo Felice. Fascinating monuments and castles with interesting traces of the old ages enriches the region and offers possibilities for day excursions in case you would like to rest for a day. There are fabulous opportunities to go cross-country skiing in the deep forests of Pescocostanzo or the fantastic ski tracks of the Campo Imperatore Plateau. You can also visit the lake of Campotosto or the valleys of the Chiarano area. After a full day on the ski slope, go indoors and replenish yourself with the Abruzzian kitchen. Lovely traditional dishes with historic traces will make you want to come back year after year. Untouched landscapes, a strong local identity alongside the hospitability among the inhabitants makes Abruzzo the perfect destination for a unique and unforgettable winter holiday. You can read more about Abruzzo on their offifical web site here.